Our search for yet more deep-sea vents in the Cayman Trough continues, with Autosub6000 coming back from its latest mission this morning, and HyBIS going out on another dive today. Autosub6000's latest mission pushed its navigational ability to its limits. It surveyed two layers of the deep water in the Trough: one between 4200 and 4400 m depth, and the second between 4600 and 4800 m. Each survey consisted of parallel lines and turns - 'mowing the lawn' - to cover a survey box, with the vehicle 'seesawing' - diving and climbing at angles of 45 degrees repeatedly along each line. Autosub6000 positions itself by sending sonar signals to the seafloor, but this is only effective when less than 200 metres above it. At times during this mission, the vehicle was more than 400 metres above the seafloor, so it could not lock on to navigate. Although Autosub6000 is usually completely autonomous, for this mission we shepherded the sub with the ship. By watching data fed back from the sub, Steve and the Autosub6000 team could send it signals to stay on course to complete the mission. Whilst the Autosub6000 usually operates independently on missions, HyBIS (the Hydraulic Interactive Benthic Sampler), our ROTV (Remotely Operated Towed Vehicle), is 'flown' by a pilot aboard our ship. This small and versatile vehicle was by conceived by our expedition Chief Geologist, Bramley Murton (seen tinkering under the vehicle's bonnet, below! ), and built by the UK engineering firm Hydro-Lek Ltd.
We launch HyBIS from the ship using a winch, and the vehicle is attached to the ship throughout its dives by an umbilical cable (unlike Autosub6000). This cable allows the pilot to 'fly' HyBIS, and relays back live pictures and data from the ocean floor. HyBIS has three video cameras, including a high-definition system that is actually a regular high-street camcorder in a pressure housing. 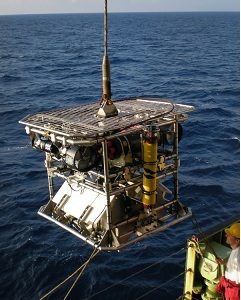 HyBIS can also collect samples and carry various sensors - effectively it is our eyes and arms on the seafloor for studying vents close-up. Sometimes perhaps a little too close - HyBIS has come back with a few scorch marks in places. 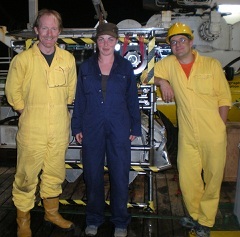 Our pilots on this expedition have been Bramley, Veit and Maria. Using a hand held control box with two joysticks - one for each of the vehicle's thrusters - the pilot controls direction and speed. 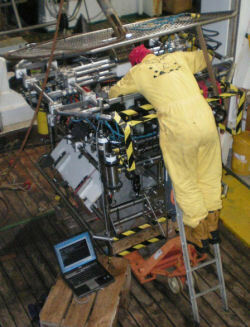 The ship's winch controls vertical movement, unlike conventional and more expensive remotely-operated vehicles (ROVs). There are also controls for the lights and cameras, and a compass to help navigate across the ocean floor. 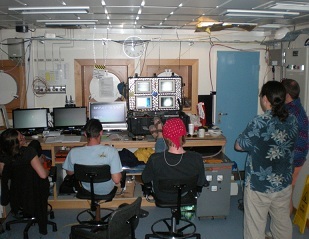 All the video images from the vehicle come back to monitors in the control box, and are then piped to a large screen in the main area of the lab for all the science team to watch. HyBIS has a modular design that allows it to carry out a variety of tasks by carrying different combinations of instruments and equipment. The upper section of the vehicle is the 'command and control' module, which looks after power, telemetry and navigation for the vehicle. The lower section is detachable, and can be customised - on this expedition we are using a 'clam shell' grab module (so-called because it closes like a clam shell) for collecting samples. HyBIS has made six dives on our expedition so far. Today's was a record - the vehicle's deepest dive yet, down to 5162 metres, to explore the geology of the southern end of the volcanic zone that we are studying. HyBIS has also dived on the slopes of Mount Dent, and completed three dives at the vents that we've discovered, with more scheduled there next. For its last dive at the vents, HyBIS carried additional sensors to study the vent fluids close-up, and a filtration system to capture the particles in the 'black smoke', which the geochemists will analyse back in their lab ashore. HyBIS has surpassed our expectations with what it has done so far - and we're excited to see what the remaining dives will achieve.